Nadieszda Kizenko is Associate Professor of History at the University at Albany, and Writer-in-Residence at the Jordan Center. This piece originally appeared on the Foreign Affairs website. But to conclude that the Russian Orthodox Church is nothing more than a bastion of extreme conservatives is to miss the many ways that change is being forced upon it. In some sense, the church’s ultraconservatism is on the wane — for confirmation, one need only look to what’s happening among the laity, rather than to the very top of the church’s hierarchy. Devout Orthodox Christian journalists, academics, and political scientists — as well as free-thinking priests — are becoming increasingly assertive as alternative spokespeople for their faith. This burgeoning Orthodox intelligentsia is already posing a challenge to the conservative church hierarchy and, by extension, to Vladimir Putin’s regime. This is not the first time that the church has produced prominent dissident intellectuals. Early in the twentieth century, Father Georgii Gapon was one of the Russian Empire’s most prominent liberal critics, leading an unsuccessful workers’ demonstration in 1905 that came to be known as Bloody Sunday. In the 1970s and 1980s, the Russian public was captivated by charismatic priests such as Father Alexander Men and the dissident Father Gleb Yakunin. In 1992, Yakunin co-chaired a parliamentary investigative committee that exposed a vast network of collaborators among clerics, particularly at the highest levels. But the current crop of dissidents is different: although they are devout, they are not all members of the clergy. The most influential (and liveliest) discussions about the church’s future as a political actor were initiated instead by a group of Orthodox journalists and activists in the aftermath of the disputed December 2012 presidential primary vote. This group includes journalist Konstantin Eggert; Aleksei Ulyanov, the deputy director of the Moscow Administration’s Department of Science, Business, and Enterprise who was formerly with the socially liberal Yabloko party; and Andrei Zolotov, the founding editor of Russia Profile magazine. Since then, the ten-member group has regularly recorded its bimonthly meetings. In doing so, it has brought to bring to light the deep discontent among some Orthodox laity about the church hierarchy’s alliance with the state. It’s significant that the young Orthodox professionals gaining influence in the church are as likely to be female as male: they are introducing increasingly diverse voices in church publications. Women now dominate the rapidly growing field of religious media, which ranges from glossy mass-market magazines to religious bookstores and publishing houses, blogs, and social networks, as well as television and movie production studios. Among the most prominent women in this sector include Anna Danilova, the editor-in-chief of the leading Orthodox Web site; Marina Zhurinskaia, the editor-in-chief of the theological journal Alpha and Omega; journalists Xenia Loutchenko and Maria Sveshnikova; and Natalia Rodomanova, the documentary filmmaker. Orthodox academics have also been contributing to the insurrection against the church hierarchy. In the Soviet period, scholarship had to be couched in crudely Marxist terms, and the Orthodox Church was mostly excluded from any scrutiny. But since 1990, sophisticated scholarship on contemporary religiosity has been a growth industry. Conferences on, and studies of, religion abound. And, as with the religious mass media, the striking thing is the Orthodox academia’s refusal to commit to the party line. A growing number of scholarly publications emphasize the diversity among Russian spiritual beliefs — what the religious life of believers actually looks like (many Russians claim spiritual rewards from buying organic produce from Orthodox farmers), as opposed to what sociologists or clerics think they ought to look like (say, praying or going to church). Sociologist Nikolai Mitrokhin, who has studied the contemporary Orthodox Church in the greatest detail, goes furthest in criticizing the church-state alliance — including what he calls the “gay mafia” in the church hierarchy. But even those scholars who do not support an explicit political agenda have helped to undermine the church’s claims about a single “true” Orthodoxy. It’s not just laypeople who have adopted a critical approach to contemporary Russian Orthodox Christianity. Priests have joined the conversation, too. Archpriest Georgii Mitrofanov, a church historian and film critic, has sparked controversy by suggesting that Russians should show more nuance in their understanding of World War II, rather than celebrating it as an unqualified victory deserving of a “holy flame.” This attempt to desacralize World War II is especially important because both the church hierarchy and Putin have explicitly encouraged that war’s spiritual and political significance to bolster their popular standing. Mitrofanov has been publicly accused of both heresy and blasphemy, simply for acknowledging the difficult choices faced during the war by Russians who had just undergone the worst decade of Stalin’s terror. Despite pressure from the hierarchy, he has managed to keep his job in the church. Sergei Chapnin, the editor-in-chief of the Journal of the Moscow Patriarchate, the main publication put out by the Russian Orthodox Church, has challenged the symbiosis of church and state most directly. His recent book, The Church in Post-Soviet Russia: Dialogue with Society, Subjective Thoughts on the Present and the Future,argues that the church’s relationship to society has become dangerously distorted. In the two decades after communism, the church could claim that it was the leading civic institution in Russia. But now, Chapnin argues, particularly after the protests connected to the elections and persecution of opposition leaders, “Society has once again begun to pose sharp and painful questions to the Church with ever greater and unheard-of persistence.” These questions include how to pursue a “common good” and a system of law that has the well-being of citizens as its top priority. If the church shuns dialogue with the rest of society in favor of maintaining a close relationship with the state, Chapnin warns, “this will be a serious blow to its authority.” The church, Chapnin thinks, should move away from the radical right fringe, and to create church structures that would expressly support lay participation, by acknowledging, for example, that laypeople have canonical rights as well as responsibilities. Most of the church hierarchy is likely to resist this newly emergent civic orthodoxy. It still believes that the church’s radical right wing commands respect and admiration, both among clerics and the public. 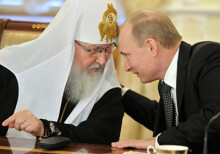 It is no accident that the chief spokesman for the Moscow Patriarchate, Vsevolod Chaplin, delights in scabrous sound bites on everything from an “Orthodox dress code” to hailing the transfer of power from Dmitry Medvedev to Vladimir Putin as a model of “friendliness and dignity.” But as Eggert has noted, this is hardly a sustainable strategy. The church’s apparently automatic support for all of the Kremlin’s initiative — whether it is blessing rockets at a military parade or Putin at his inaugurations — is demoralizing would-be believers. They continue to tolerate the church-state alliance, but they have reduced their participation in official religious and political institution to a minimum. And that makes them liable to jump ship the next time a capable alternative — whether political or religious — arises. Indeed, the church’s main problem is that its support among the faithful is being outpaced by discontent about its ultraconservatism. Kirill himself seems to have recognized this: he has recently taken a far more guarded stance recently when speaking about the church’s role in politics. But it could be too little, too late. If change from within is to occur, it will likely come from Russia’s new voices.